(Toronto, Ont.) The two-year countdown to the Toronto 2015 Parapan Am Games —the largest ever held — will be celebrated on Wednesday, August 7 with a celebrity wheelchair basketball game in Toronto and a formal ceremony and community parasport event in Whitby. 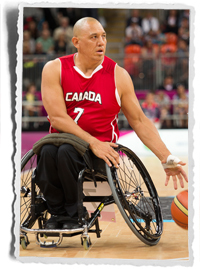 Famed Canadian wheelchair basketball star Richard ‘Bear’ Peter will lead the 2:00 p.m. game, featuring sport and media celebrities as well as local politicians, at the Mattamy Athletic Centre at the Gardens, while Toronto Raptors announcer Matt Devlin will call the play-by-play action on the court. The day’s celebrations will start at 9:30 a.m. at the Abilities Centre in Whitby. Children from local summer camps, community members and dignitaries will have the opportunity to try boccia, judo and other parasports that the 1,500 athletes from the Americas and Caribbean will compete in in 2015. The Town of Whitby will also receive a special mural, created by sports artist David Arrigo through the Pan Am Mural Experience presented by CIBC. The one-of-a-kind artwork captures the town’s unique cultural and sporting history and will remain in Whitby as a permanent memento of the Games. The Parapan American Games take place August 7-14, 2015. The wheelchair basketball competition will double as the qualification tournament for the Rio 2016 Paralympic Games. Close to 7,000 athletes from across Latin America, South America, the Caribbean and North America will put their years of intense training, perseverance and sacrifice to the test in world-class competition in 36 Pan Am sports and 15 Parapan Am sports at the TORONTO 2015 Pan Am/Parapan Am Games. For more information, please visit www.toronto2015.org.